Creating and writing content is probably the most time consuming task of any online business. And yet, it is what makes or breaks your brand, what boosts your sales, what tells your story. So let’s say you just finished writing your blog posts, you found all the right images, you fixed all the headers and seo keywords. Now you have to go and publish it on all your social media channels? And what if you have 10 new articles per week, how are you supposed to find the time to post every article onto every Facebook and Linkedin group that you manage? or tweet it to your followers? Publishing your content can become a time consuming task. We created the “Autopost with RSS” feature just for this purpose: to automatically publish new content to all your social media profiles and accounts. This feature will only publish new content once (it will not repeat publishing the same post more than one time). Login to eClincher and follow the steps below. Scroll over the publishing tab and choose the Auto Post with RSS feature. Once you click on that you will see the RSS window appear. First, select the source of the RSS feed you would like to add. You can have on generic “RSS feed” Selection and paste your RSS url. 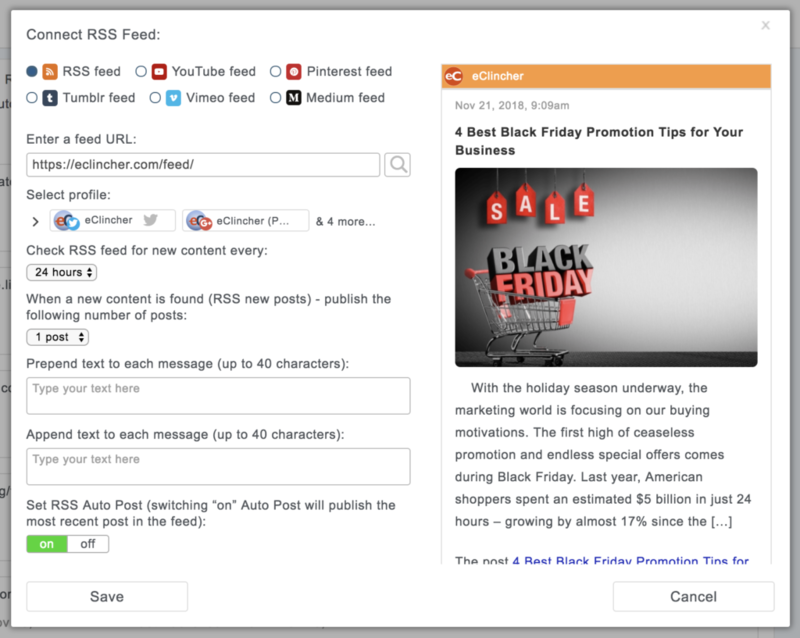 If you select other sources, such as YouTube or Pinterest, we will guide you how to create RSS feed from your channel. After pasting the url, click on the magnifying glass, and choose the option that says “feed”. Don’t choose the comments feed a it will only display the comments that were left on your blog posts, and not the blog posts themselves. 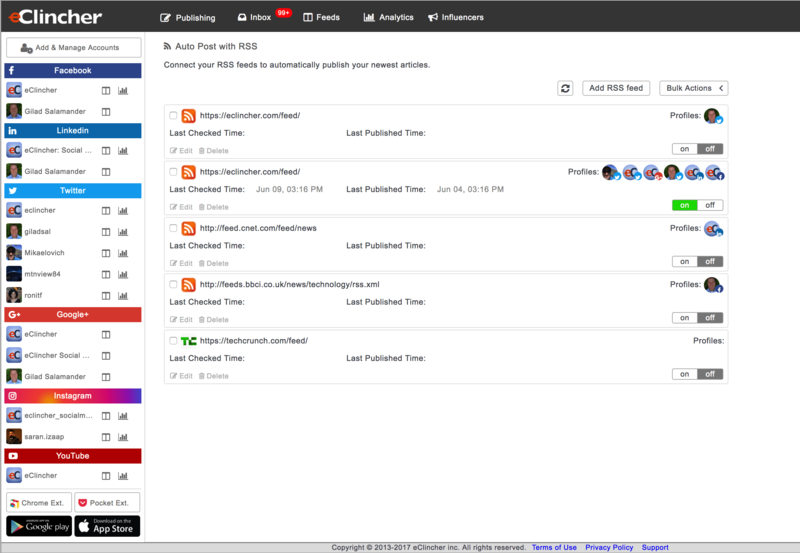 Next, select which social media profiles you would like to automatically publish fresh new content. 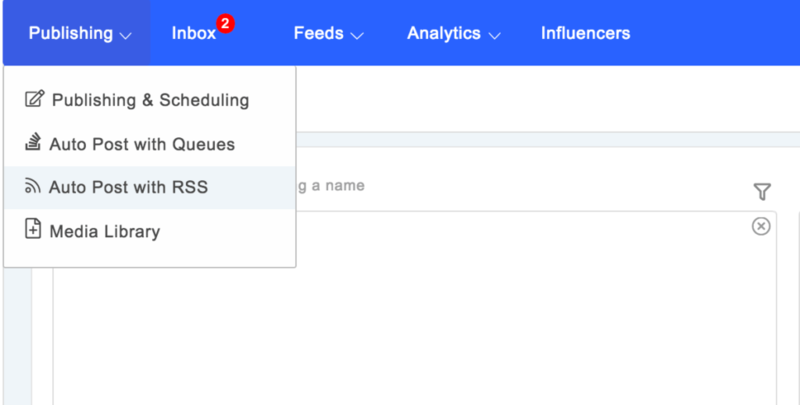 Next, select how often you would like eClincher to “check your connected feed for new content”. Once a new post is detected, eClincher will automatically publish the post. The default is every 24 hours. Next, select how many posts you want to auto publish. You can select 1 to 3 posts. Note, eClincher will only publish new posts if detected. It will not repeat posts. Lastly, click on “on” button to turn on auto publishing from RSS feed. Now every new blog post will be automatically publish on all of your chosen social media profiles. This feature will probably shave off 2-5 hours every week depending on how much you write. Thanks for sharing this method! I know about RSS but never actually used them. Thanks for the article, visit http://www.dmsdigitalserv.com/ for more information about web design and development, Seo and digitl marketing etc.